Earn 14 loyalty points when you order this item. QED Silver Anniversary XT biwire is a multi award winning cable, a natural replacement for standard Silver Anniversary, offering better performance at a low price - price includes free UK delivery and QED's lifetime warranty. 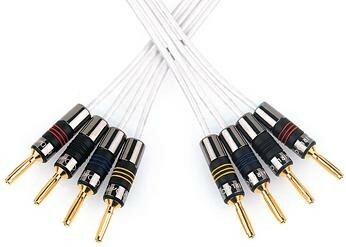 Designed with performance in mind, the Silver Anniversary XT speaker cable boasts all of the characteristics associated with Silver Anniversary but with the added enhancement of the Aircore technology found in the more expensive X Tube series. Price is per metre. Enter total of metres needed in quantity box and click BUY. Supplied unterminated (bare wire). You can also order QED Termination Service, for which we use high quality QED Airloc plugs as shown in the photo above. (If you order 4m, and order termination, we will terminate 2 x 2m lengths, if you order 10m, we will terminate 2 x 5m lengths, and so on). As this is a biwire cable, this termination is available as biwire (2-4) or biamp (4-4). If you have several cables you need terminated or prefer to discuss termination on the phone, you can call to order on 0121 224 7300.